In the beginning stages of awakening, before the Soul merge takes place within a person, there can be no interference from the higher realms due to the Divine gift of free will, which ultimately became a gift with great and burdensome consequences. 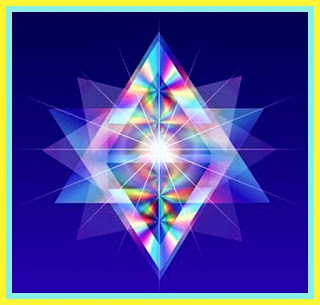 However, when a person attains an energetic signature which resonates with the Violet Flame frequencies of the mid-fourth dimension and above, he/she is ready to affirm: "Thy will be done. I ask for my greatest good and the highest outcome for all," thereby aligning the personal will with the Will of the Higher Self and the Divine Blueprint for the Earth. As a result, a magical path of Light is extended to that Soul via his/her personal column of Love/Light/Life. This Pathway of Light, often called the River of Life, leads to an authentic Essence Consciousness, whereby each person who reaches the required level of consciousness will begin to receive his/her special portion of encoded crystalline Seed Atoms for the new galactic or Sub-Universal Divine Blueprint / Mission. These new Seed Atoms will also contain the advanced wisdom, talents, attributes and qualities necessary to qualify as a participant in the early-stage, creative process for the new Golden Galaxy of the future. Heretofore, the masses have lived in a world of veiled, illusional awareness, and it seems they are now facing a future that feels much like a ship that has been cast into a stormy sea without a rudder. That is because the Primal Life Force energy that has been available to all humanity over the past age is no longer filled with God Seeds of great potential from within the old Divine Blueprint for this Sub-Universe. The masses will still receive the vibrational patterns they need to maintain the status quo. And, we assure you that the loving energy of our Father/Mother God and the Beings of Light will always be available to humanity; however, in order to tap into the new Divine Blueprint that is awaiting each Soul, there must be an attunement to at least the mid-fourth-dimensional frequencies of Light. Our Father/Mother God's greatest desire is to see all facets of their "Beingness" return to Self-mastery so they may enjoy the love, peace, joy and abundance that is every Soul's Divine Birthright. There will always be help available from the great Beings of Light, and the angelic realm will always answer calls or pleas for assistance. However, there are immutable universal laws that must be adhered to, and it must be each person's choice as to which path they will follow: the Path of Light or the path of shadows. You, the Star Seed, who have balanced and harmonized the vibrational patterns of your four lower bodily systems so that your Soul Song is resonating to the fourth sub-level of the fourth dimension and higher, are now beginning to access the HIGHER FREQUENCY RAYS OF THE GOLDEN AGE OF THE FUTURE.. There is a new Divine Blueprint for this Sub-Universe and for each person who is ready to don a shining cloak of many colors-a refined auric field of Light-signifying a readiness to receive the virtues, qualities, talents, abilities and aspects of the New Age. These wondrous gifts are programmed within the Adamantine Particles of Creator Light, and they are now available to those of you who have attained the required level of Self-Mastery. The SACRED WHITE COSMIC FIRE, Adamantine Particles, that you magnetize to you as an awakened Self-master must continually circulate. Only a certain amount; that which is appropriate for each Soul to integrate at their current level of en-Lighten-ment-can be stored within the physical vessel; the balance must be RAY-diated out into the world of form. As a result of its alignment with the Galactic Center and attunement with the Great Central Sun of the Galaxy, the Earth is in the process of raising its frequency patterns-Soul Song-so it can return to its status as a Sacred Planet. This Sub-Universe is also being upgraded in vibrational frequencies as a result of being bombarded with the Adamantine Particles of Creator Light via our universal Father/Mother God. The Milky Way Galaxy is also divided into twelve sectors or quadrants, just as the universe is divided into Sub-Universal sectors, and each quadrant within the Galaxy has a governing Council of Twelve. Hopefully, you are gaining a better understanding as to the importance of the numbers 12 and 144, for these numbers apply to many facets of creation throughout this Sub-Universe. We have taught you to become "a living meditation" whereby you are able to function efficiently in your earthly environment while maintaining a balanced Alpha State of consciousness. The next step is to endeavor to live in a constant state of joy and gratitude, thereby becoming a "living prayer." As you become more proficient as cocreators on the earthly plane, you must constantly monitor your energy patterns and seek to upgrade them. You must strive for sustained harmony and refined godly expression. You must liberate the power of the Sacred Fire within which, for most, has lain dormant for many thousands of years. You must learn to direct and focus your energy into the areas of your life you wish to change. By establishing and constantly upgrading your Creator Wheel of Life, you are planting the seeds of focused change, and you will be supplied with the Sacred Fire of Creation needed to manifest what you have envisioned. Your major goal must be to gain Self-Mastery while in the physical vessel. When your endeavors are directed toward the highest good for all humankind, a special dispensation is given, and a greater measure of Creator Light will be made available to you. Imagine, dear ones, how it would feel to have access to an unlimited supply of Divine Creator Essence. Envision yourself as a great energy vortex, pulsating with power, sending out great Rays of luminous color, radiating waves of energy and creating any and everything your Soul Self can envision. Sense how you would feel as the energies you project swirl and solidify, as structure and form become discernible, beautiful and unique beyond measure--your creations--through the power of your thoughts, love/emotions and inspired imagination. We are endeavoring to help you understand why you and the Earth are so important during these chaotic times on your planet. In this galactic experience, the Earth is the place to be during this extraordinary period of evolution of the species and expansion of this Sub-Universe. Build your vision, my brave and faithful Ones. Start within your own Sacred Heart center and reclaim that power and magnificence that is your Divine heritage. Then, begin to radiate that power and perfection into your physical vessel and outwardly into your world: your relationships, your work place, community, country and world. Allow all that no longer serves you to continue on its path of limitation or to join you in the realm of higher frequencies of unlimited potential via the process of transmutation. The path toward the Light and the path spiraling further into darkness have now come to a distinct point of separation. You are being forced to face, once and for all, the residual shadows of Self--all the imbalances and restrictions that are holding you back from fully empowered Self-realization. Being a Self-master is not for the timid or weak of heart, dear ones. Accept my Sword of Light, which is encoded with the DIVINE WILL POWER of our Father God, and accept a shining CHALICE OF LOVE/LIGHT from our beloved Mother God as we go bravely forward into the dawning of the new AGE. I am ever near to guide, direct, inspire and protect you. I AM Archangel Michael.